Presenting an overview of an emerging field in the study of contemporary religion, this book, together with a complementary volume Religion in the Neoliberal Age, explores issues of religion, neoliberalism and consumer society. Claiming that we have entered a new phase that implies more than the recasting of state-religion relations, the authors examine how religious changes are historically anchored in modernity but affected by the commoditization, mediatization, neoliberalization and globalization of society and social life. 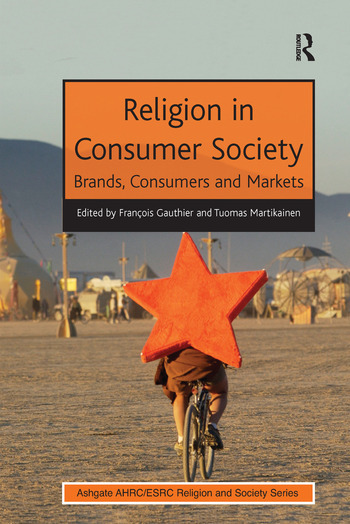 Religion in Consumer Society explores religion as both shaped by consumer culture and as shaping consumer culture. Following an introduction which critically analyses studies on consumer culture and integrates scholarship in the sociology of religion, this book explores the following topics: how consumerism and electronic media have shaped globalized culture, and how this is affecting religion; the dynamics and characteristics of often overlooked middle-class religion, and how these relate to globalization and differences between 'developed' and 'emerging' countries; emerging trends, and how we understand phenomena as different as mega churches and holistic spiritualistic journeys, and how the pressures of consumer culture act on religious traditions, indigenous and exogenous; the politics of religious phenomena in the Age of Neoliberalism; and the hybrid areas emerging from these reconfigurations of religion and the market. Outlining changes in both the political-institutional and cultural spheres, the contributors offer an international overview of developments in different countries and state of the art representation of religion in the new global political economy. Contents: Preface, FranÃ§ois Gauthier and Tuomas Martikainen; Introduction: consumerism as the ethos of consumer society, FranÃ§ois Gauthier, Linda Woodhead and Tuomas Martikainen; Part I Changing World Religions: Religion, individualisation and consumerism: constructions of religiosity in ’liquid’ and ’reflexive’ modernity, Simon Speck; From standardised offer to consumer adaptation: challenges to the Church of Sweden’s identity, Per Pettersson; Packaging religious experience, selling modular religion: explaining the emergence and expansion of megachurches, Stephen Ellingson; The paradoxes of new monasticism in the consumer society, Stefania Palmisano; ’Find your inner God and breathe’: Buddhism, pop culture, and contemporary metamorphoses in American Judaism, Mira Niculescu; Shopping for a Church? Choice and commitment in religious behaviour, Francesca E.S. Montemaggi. Part II Commoditised Spiritualities: Entangled modernity and commodified religion: alternative spirituality and the ’new middle class’, Andrew Dawson; The enchantments of consumer capitalism: beyond belief at the Burning Man festival, FranÃ§ois Gauthier; Buddha for sale! The commoditisation of Tibetan Buddhism in Scotland, John S. McKenzie; Mutual interests? Neoliberalism and New Age during the 1980s, Lars Ahlin; Healing or dealing? Neospiritual therapies and coaching as individual meaning and social discipline in late modern Swedish society, Anne-Christine Hornborg; Valuing spirituality: commodification, consumption and community in Glastonbury, Marion Bowman; Bibliography; Index.